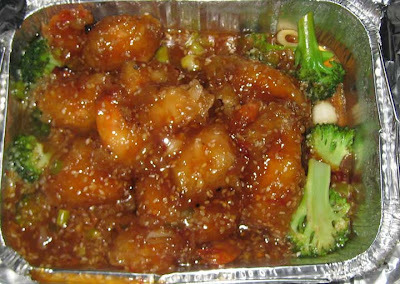 Before we discovered Grace Garden, our go-to place for Chinese food was Szechuan House, mostly because they deliver, even though we live almost 4 miles south of the restaurant. 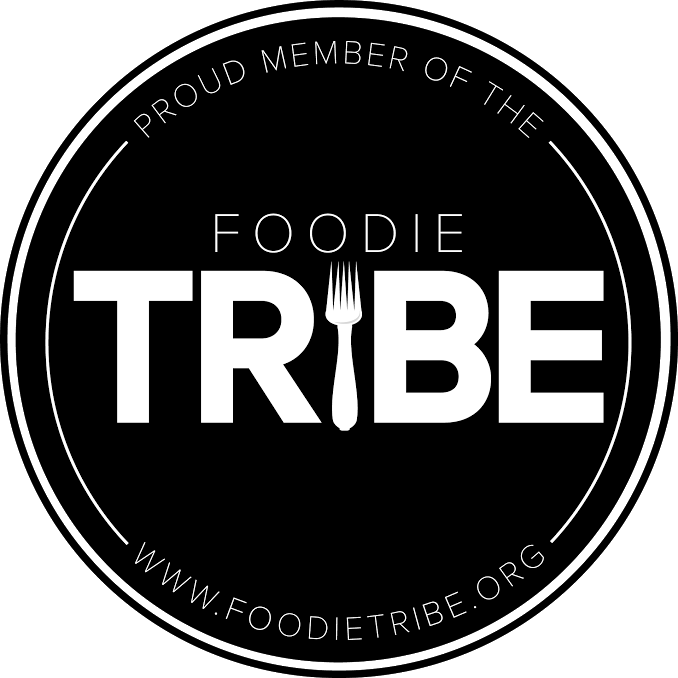 But the food is probably the best in the vicinity, and they even have a small section of the menu dedicated to authentic Chinese dishes, several of which involve "intestines." Haven't tried any of those, and not sure if I ever will. After cooking bacon in the heat last weekend, the last thing we wanted to do was cook. Nor did we want to go out to eat. Szechuan House to the rescue! We ordered our usual quart of won ton soup (a whopping $2.50) and two spring rolls to start. Somehow the spring rolls are ALWAYS hot and crispy when they get to the house. 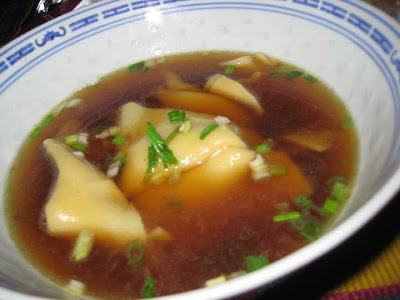 The won ton is sometimes more wan than anything, but this time it was bold and flavorful, with at least six whole pork-filled won ton noodles in a rich broth. 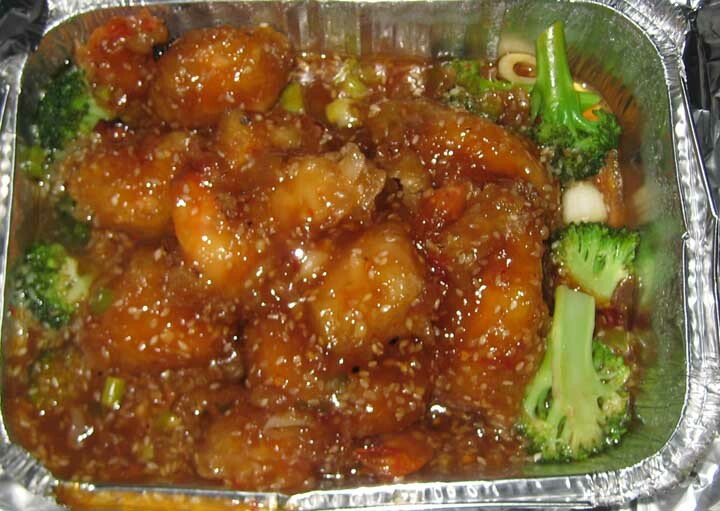 There are several dishes that we order on a regular basis: Chinese broccoli with oyster sauce; shrimp with ginger and scallion; shredded pork with dried bean curd; beef chow fun; Peking duck; Chicken with string beans; General Tso's chicken. All are uniformly tasty. There are also dishes we avoid: moo shu anything, and kung pao anything. There's nothing wrong with the kung pao dishes, we simply aren't enamored with the flavor (or lack thereof). As for the moo shu - it *tastes* fine, but the smell of the dish wafting out of its cardboard container is rather off-putting. Sometimes I think maybe an intestine or two snuck in there. 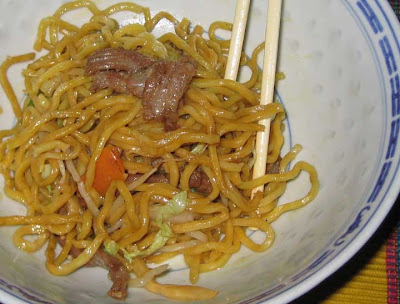 This time we ordered two dishes we had not yet tried at Szechuan House: beef lo mein, and shrimp in sesame sauce. The lo mein was a bit on the bland side, but it was miraculously non-greasy. 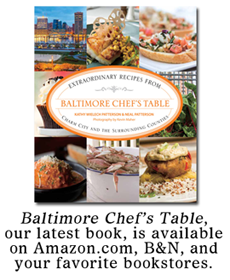 If you're in the Baltimore area, what is your favorite Chinese restaurant? Your favorite for carry out or delivery? Do you go to Szechuan House? I'm glad to hear that it's good though, and Dan will especially like to hear that their general tso's chicken is delicious!